Every year near the NBA trade deadline fans wait to hear if their team is making a move, which player they are getting and who is going where. But when a player ultimately gets traded, it goes far beyond just exchanging their jersey for a new one. When then-Miami Heat guard Tyler Johnson woke up on Feb. 6 to multiple missed calls from his agent, he had a feeling he was about to have a new place to call home and the first thought that came to his mind was his children. “My initial reaction was ‘what am I going to do with my kids?” Johnson said. A father of a five-year-old and a one-year-old, Johnson had to travel across the country to Arizona while his two children remained in Florida. Just as Johnson has to adjust to his new team and a new system, he also needs to adjust his life around his new situation. Johnson understands the nature of the business, but that doesn’t remove the human emotions that any parent would feel in a similar situation. 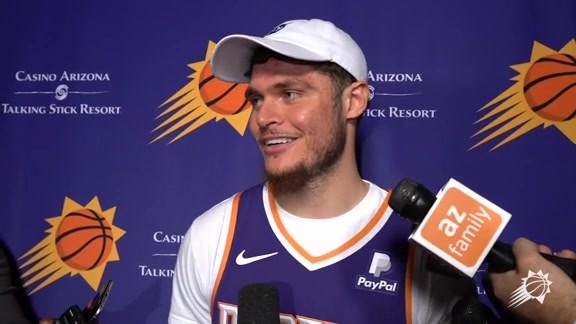 The Suns organization has worked closely with Johnson to help make the transition as smooth as possible and make sure that he feels comfortable in his new home. Johnson has a routine of going to the practice court and putting up shots following most games. He was joined by two special guests a recently as he and his children were able to spend some quality time together when they visited their father in Phoenix. And of course, both children are repping their father’s number 16. While Johnson continues to adjust to his life off the court, he seems to be fitting in quite well with the newly-formed Valley Boyz on the court. The team had won five of the last eight games that he’s played in while he’s averaging a career-high 4.2 assists in his new role as starting point guard.